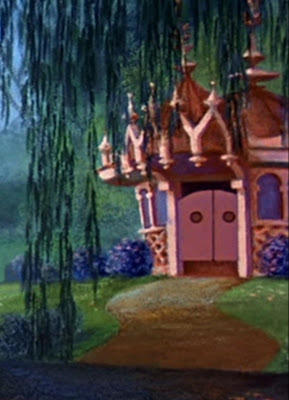 After a brief look at SNOW WHITE backgrounds, we return to MARY POPPINS. With Mary and Bert seated and ready for afternoon tea, our little penguin friends appear to extend their special aviarian hospitality. They are certainly not the only actors/singers/dancers in show biz waiting tables, either! The restaurant from which they emerge is beautifully designed and realized, amidst the lush foliage of the chalk landscape. The second digitally reconstructed landscape shows the entire pan B/G for the right side of the Jolly Holiday penguin segment, from the restaurant to the edge of the staging area for their musical presentation. Close scrutiny reveals two different takes of the same concept. again, perhaps diffferent artists? The long pan reveals much more detail... and more extravagant landscaping! I must comment on the color palette too. I didn't adjust anything here, the original art is drenched with all these wonderful rich colors. Delicious!